The lady is no lady at all. It’s Christopher Plummer as he appears in his latest film The Silent Partner. Chris plays a psychopathic bank robber who disguises himself when he robs banks. One day he’s Santa Claus. Another is a woman. Whatever he is he always wears a silver ankle bracelet and pink false nails! Costume designer Deborah Weldon dressed Christopher for this sequence. “He’s a brilliant man who knows exactly how he wants to look,” Miss Weldon explains. 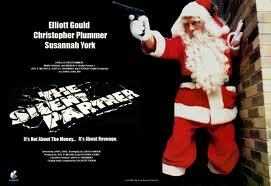 Also starring in The Silent Partner are Elliott Gould and Susannah York. Gould plays a bank teller who dreams of a more exciting life. He turns to robbing his own bank and succeeds in outwitting our strange bank robbing friend as well as seducing the robber’s girlfriend. Finally Gould wins the affections of his bank manager’s mistress, Susannah York. Plummer’s role must surely be his most bizarre. He’s made over 20 movies, including the Fall of the Roman Empire; Conduct Unbecoming; The Return of the Pink Panther; The Man Who Would be King and, of course, The Sound of Music, in which he played Von Trapp, a role that eventually brought him problems. “For some time, he says, “I was recognised because of a part which I didn’t feel was particularly exciting, even though it was successful. People only thought of me as Von Trapp. Determined to get out of that rut he searched for more demanding roles. Normal? I most ironic statement from someone playing a psychopathic bank robber who wears a dress!